Now the evenings are drawing in (or rather, have drawn in!) 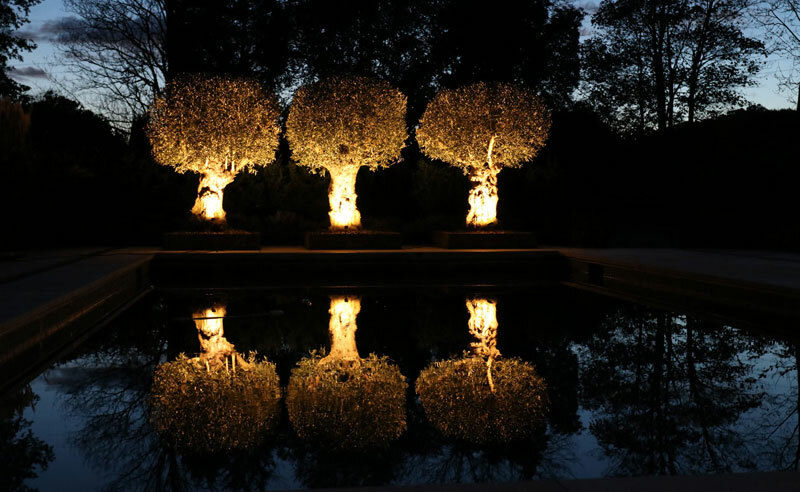 it’s a good time to think about garden lighting. Even in a small space, a few lights beneath specific trees or shrubs, or, as in my own garden, highlighting a modern sculptural bird bath, can help extend the enjoyment of your garden. I recently revisited a garden in Surrey that I designed a few years ago, and as evening came on, I was able to appreciate the lighting that had been installed when the garden was built. One of the features of the garden was a new wall linking the kitchen and the garage, separating the parking area from the main garden area. The new terrace on the garden side has low level lighting that highlights the texture of the wall (and the wonderful arch that my clients bought and that we incorporated into the design) and also throws the adjacent plants into silhouette. Leading from the terrace is a crazy paved path with twinkly lights, surrounded by grasses (mistakenly cut back! they should still be 3′ tall with pale wispy seedheads but they will be next year!). Apologies that this photo is blurry – I hadn’t taken my tripod – but atmospheric none the less. This path leads round to the pool garden, where three beautiful olive trees make a wonderful feature at the far end, reflecting magnificently in the water. If you’d like to see this garden in daylight, you can find images of it listed under my surrey garden.